Rob set out on his spiritual path more than 30 years ago and has seen firsthand how yoga and meditation can bring about radical personal and social change. 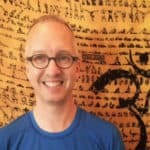 After 20 years in corporate finance and venture capital, Rob left his career to focus on service, or karma yoga: helping others to discover for themselves the benefits of bring spiritual practice in to daily life. He has been teaching yoga and meditation for more than a decade and is known for a playful, warm and accessible style of teaching. Rob completed his Teacher Training with Sri Dharma Mittra in 2007 and has also completed a 5 year program of study in Trul Khor, a form of Tibetan yoga, in 2015. As a long time student of Geshe Tenzin Wangyal Rinpoche, Rob is President of Ligmincha International, a global sangha of Bön Buddhist practitioners.